This product is under last-time buy. Orders may be placed until 31st December 2019, and will be fulfilled based upon availability. As an alternative, please refer to the 869 relay. The SR469 Motor Protection System, a member of the SR family of relays, provides protection, control, simplified configuration and advanced communications in a cost effective industry leading draw-out construction. Designed for medium voltage motors, the 469 delivers advanced protection with customizable overload curves and single CT differential protection for added flexibility. The 469 also provides simplified configuration using the Motor Settings Auto-Configurator, providing a quick and easy set-up of motor parameters. Coupled with advanced protection and diagnostics, the 469 provides users the flexibility of multiple communication protocols allowing integration into new and existing control networks. 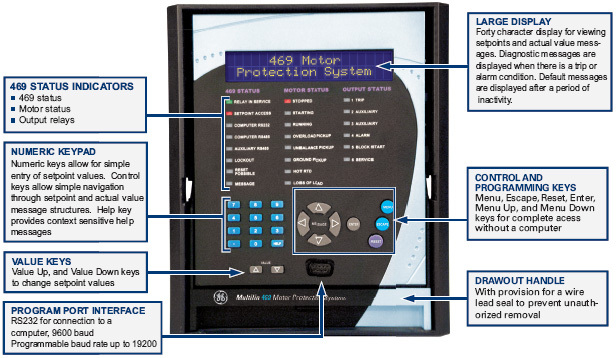 The 469 is a digital motor protection system designed to protect and manage medium and large motors and driven equipment. It contains a full range of selectively enabled, self contained protection and control elements as detailed in the Functional Block Diagram and Features table. 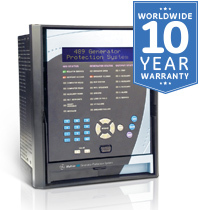 The 469 includes high accuracy metering and recording for all AC signals. Voltage,current, RTD and power metering are built into the relay as a standard feature. The 469 is equipped with monitoring tools to capture data. The following information is presented in a suitable format. The event recorder stores motor and system information with a date and time stamp each time a system event occurs. Up to 256 events are recorded. The 469 records up to 128 cycles with 12 samples per cycle of waveform data for 10 waveforms (Ia, Ib, Ic, Ig, Diffa, Diffb, Diffc, Va, Vb, Vc) each time a trip occurs. The record is date and time stamped. The Multilin 469 provides advanced motor diagnostics including a broken rotor bar detection function. The broken rotor bar detection is a condition maintenance function that continuously monitors the motor’s health while in operation. The advanced Motor Current Signature Analysis (MCSA) continuously analyzes the motor current signature and based on preset algorithms will determine when a broken rotor bar is present in the motor. Create complet settings files for your SR469 in 6 simple steps using the Motor Settings Auto-Configurator. Traditionally, retrofitting an existing relay has been a challenging, time consuming task often requiring re-engineering, new drawings, panel modifications, re-wiring and re-testing. The 8 Series Retrofit Kit provides a quick, 3-step solution to upgrade previously installed SR 469 relays. With the new 8 Series Retrofit Kit users are able to install the 869 Motor Protection System without modifying existing cutouts and wiring, and without any drawing changes or re-engineering time. 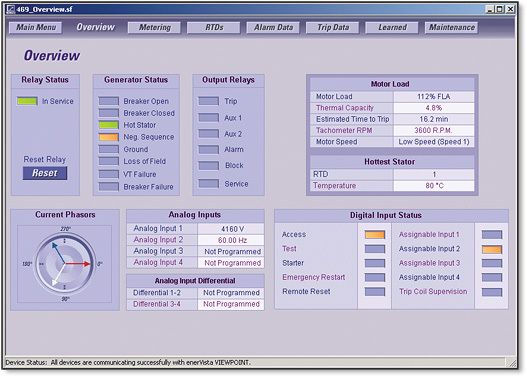 EnerVista 8 Series Setup Software provides automated setting file conversion. Once completed, a graphical report is provided to verify and call out any specific settings that may need attention. Simply remove the upper, lower and low voltage terminal blocks and then remove the SR chassis from the panel. No need to disconnect any of the field wiring. Insert the new 8 Series Retrofit chassis into the switchgear and simply plug-in the old terminal blocks - there is no need to make any cut-out modifications or push and pull cables.